My mother, Nora O'Malley, wanted her sons to have a Catholic school education and when I was three years old, she began a campaign for a Catholic school. Mother was a spirited, outgoing person and had a plan which stirred up furor within the congregation of our church. She was instrumental in bringing a unit of The Catholic Daughters to Perry. As its President, a member of the St. Catherine's Circle, and of the Altar Society, she pressured them to back her cause. My first recollection of my mother's campaign was when one day she took me to the Chicago & Milwaukee Railroad depot. When the train came in, two women, dressed differently than my mother, got off and met her. We took them home with us as they were invited by mother to discuss the ground work of starting a new school. They were Sisters of the Order of St. Francis. Every week she invited nuns to come from different localities that had Catholic schools to obtain suggestions and advice. Our local priest, James Cleary, was not in favor of the project or mother's nuisances at the time. She invited priests from various towns in Iowa that had Catholic schools to come to talk to him and also to speak to the church leaders. She made several trips to Des Moines to seek the advice of Bishop Drum who gave her much encouragement. No matter where or what an organization meeting was about, she was there to get support for her school project. My mother became ill and the diagnosis of her illness was due to overwork on her school project and taking care of her family. She was advised to restrict some of her activities. Even though ill, she could not give up her educational desire for her children. Also her plans were beginning to take shape. During this time another boy, Bernard, was born. She was disappointed, as she had so wanted a girl. Shortly thereafter she was diagnosed as having cancer but this still did not stop her school plans. Surgery was performed in Des Moines and again at Mayo Clinic in Rochester. Happily she had another child, the baby girl she wanted, Julia Elizabeth. When I was going on ten, her illness became grave. Meanwhile the school was approved and built. On her deathbed she requested of our father that he see that all four sons graduate from St. Patrick's High School. 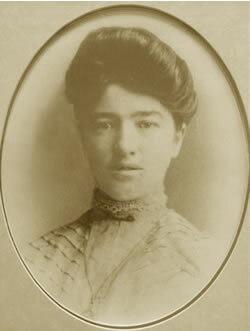 Nora died and was buried on a very cold day, February 21, 1921. Ironically, it was the same day St. Patrick's School was dedicated. My mother's dream and wishes and father's promise came true. I, George Garland, graduated from St. Patrick's in 1929; Martin in 1931; Charles in 1933; and Bernard in 1935. If Nora and George W. were alive today they would be very proud knowing that our mother's persistent hard work together with their prayers and religious fervor brought about this beautiful educational project.